Gujarat region's cultural conglomeration can be traced through decorative paintings on Harappan pottery and later Chalcolithic culture. These paintings are of variety of patterns constitute of motifs and elements like geometric, non-geometric, human, floral motif etc. 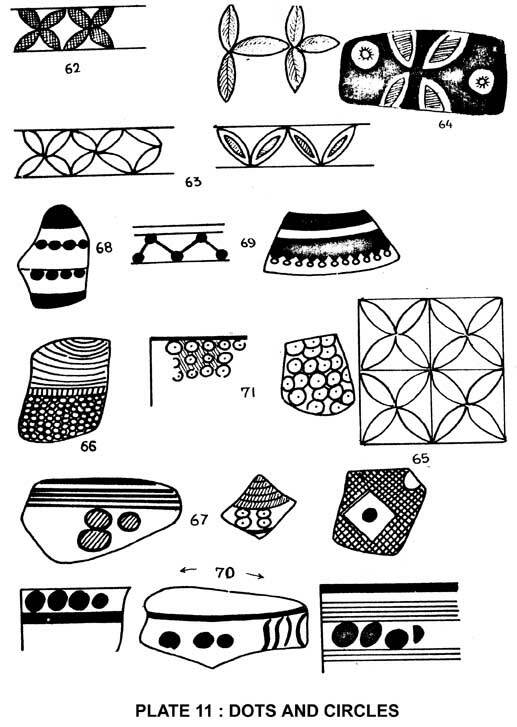 Regularity of forms, outstanding symmetry between various component motifs, supplemented by the best rhythmic effect is clearly established by Harappan potters. The paintings demonstrate a remarkable blend of geometrical as well as natural motifs, rendering natural harmony to the subject. None of the motifs represent an isolated occurrence, but the entire repertoire of painted designs is found to continue, but of course with variations and modifications, in the cultures that succeeded the Harappa culture throughout India. 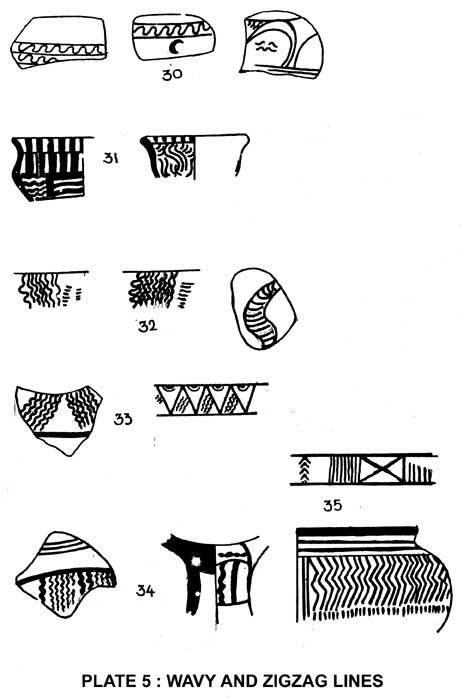 The present paper is an attempt to analyze the painted decorative styles on Chalcollithic pottery from Gujarat, where a wide variety exists. Such a study enables a probe into the various facets of receptiveness of art in a society through the paintings on pottery, a tradition that spans over time and space. Although these constitute a very small proportion of the vast material assemblage, it is of extreme significance providing a mine of information. “Painted Decoration,” means beautifying an object by applying paint on the surface of the object. These are, in the first place, the expression of the potter/painter's aesthetic sensibilities, as also a reflection of the natural surroundings. The aesthetic quality of painted pot is apparently related to the artistic beauty of the patterns executed. These design patterns constitute of motifs and elements (i.e. the basic unit or component of a design), have been classified by scholars as geometric, non-geometric, human, floral motif etc (Rao 1963; Manchanda 1972; Joshi 1972). And based on the patterning or arrangement of these elements, archaeologists attempt to impute meanings to them. The presence/absence of certain motifs, its frequency, or continuity and change over time can be used to formulate typological history and chronology. The complexity of the painting style is incurred when one looks into their internal variations in patterning the decorations. These internal variations are important in deducing regional differences of ceramic repertoire. Further, a study of the paintings on pottery is undertaken to draw information on the cultural and social life of the society in which it is seen. It is interesting to note the use of space on any vessel by the artist, as it improves the external appearance making it visually appealing (Krishnan pers. comm.). Therefore, a pilot study based on the published reports of the few chalcolithic sites in Gujarat is significant, as it would explore the scope of such unconventional works. The antiquity of painting may be traced back to the stage of developed village farming communities and pastoral societies, which was marked by an increasing sophistication of the potter's art and the introduction of the Togau, Kechi Beg, and Hakra wares (Mehrgarh IV & V, Kot Diji) ceramic assemblages. The tradition continues through the Neolithic to the Early Harappan, which is characterized by the geographical expansion on to the Potwar Pleateau and into the Indian Punjab, Harayana, northern Rajasthan, and western Uttar Pradesh as well as Gujarat. Gujarat is the westernmost state of the Indian union. It shares both the land and sea frontiers of the country. The beginning of the Chalcolithic culture in Gujarat spreading over coastal Saurashtra, north Gujarat and Kachchh can be dated back to the last quarter of the fourth millennium B.C. Therefore the earliest evidence of pottery painting is found on the ceramics from the sites of Loteswar, Padri, and Somnath. These are quite different from those of the Early Harappans, which suggests even earlier existence of pottery-making people in this region. The vessels were generally painted before firing, so that in the process of firing the paint adhered to the surface and attained durability. The colour of the paint sometimes varied due to varying temperatures during firing. Geometric motifs are those which are formed by means of basic geometric forms like straight lines, wavy and zigzag lines loops, triangles, squares, circles and dots, diamonds or lozenge pattern, chevron pattern, etc. Line is a geometric unit and forms the basic of innumerable geometric motifs. Lines may be vertical, horizontal, or oblique, whereas, the band is thicker than line, depending upon the thickness of the latter. 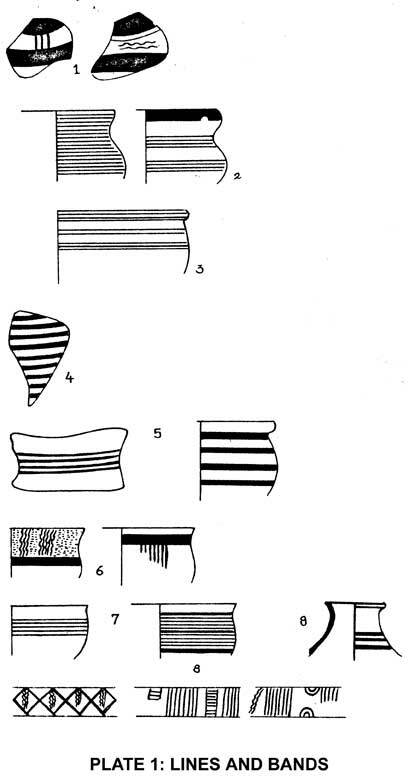 Bands serve the purpose of panel, register, or even appear as an independent element to decorate the pottery. Tracing the antiquity of horizontal lines and bands goes back to the pre- Harappan culture in India. At Kot Diji, it serves as one of the most important decorative element covering rim and neck portions of the jars. Like the pre- Harappans, the Harappans of Gujarat never or rarely used thick bands. Sometimes they used only to cover the neck and rim portions to integrate them to the rest of the portion covered by other motifs. However, in the post- Harappan period lines and bands became the most prominent element both as primary and secondary motifs. 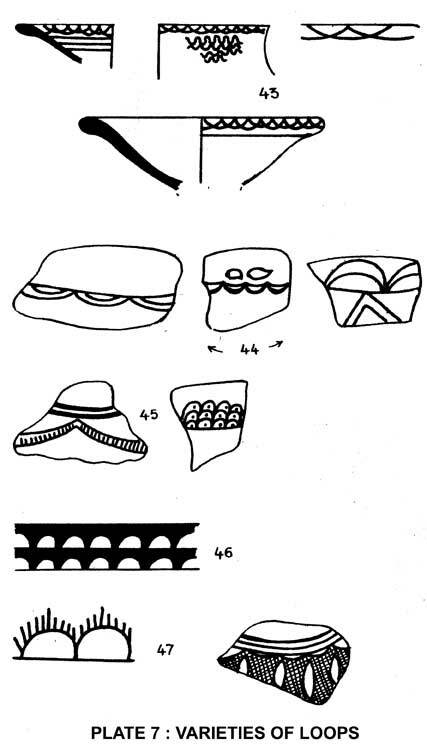 Almost all Harappan and affiliated sites show examples of horizontal lines and bands, viz. Dholavira, Surkotada, Lothal (Fig. 4), Rangpur, Rojdi (Fig. 3), Kuntasi, Nagwada, Padri, Somnath, Loteshwar, Moti Pipli, Mehgam, Telod, etc. Few examples exhibiting vertical lines and bands may be seen from Loteshwar, Padri, and Rojdi (phase 3, Mehgam, Telod, (Fig. 9) etc. Many times oblique, vertical, or wavy lines radiating from thick bands are also found. Vertical lines suspended from or with horizontal lines to form register and space (Figs. 10, 11, 12). Oblique lines used for space filling (Fig. 13, 14), criss-cross oblique lines (Fig. 15); reported from Somnath, Rangpur, Amra (Fig. 16. 17), Kuntasi, Lothal, etc. At Somnath curved lines in-group were hatched. Lattice (Fig. 13, 14). – Each specimen is found at Surkotada, Somnath, and Rangpur. Ladder – generally drawn into two vertical or oblique lines filled with horizontal lines as its steps (Fig. 20). Such types are found in Gujarat only. Wavy lines possibly had their origin in the effort to produce ripples of meandering course of the rivers and zigzag in the undulating cliffs. Such motifs are useful and easy for covering large spaces as fillers and divider, it was also found on a number of pot-sherds from many Harappan as well as post- Harappan sites of Gujarat. e.g. from Lothal, Surkotada, Rangpur, Somnath, Amra, Lakhabawal, Mehgam, Telod, Bhagatrav, Jokha, Dhatwa, Loteshwar, Nagwada, etc. Curvilinear from: Such types are found from Rangpur (Fig. 22), Somnath (Fig. 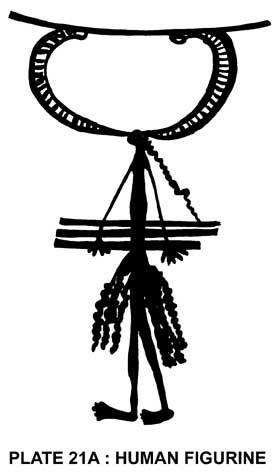 24), Surkotada (Fig. 23). Wavy lines in horizontal group: many times these lines are drawn close and many times at distance. 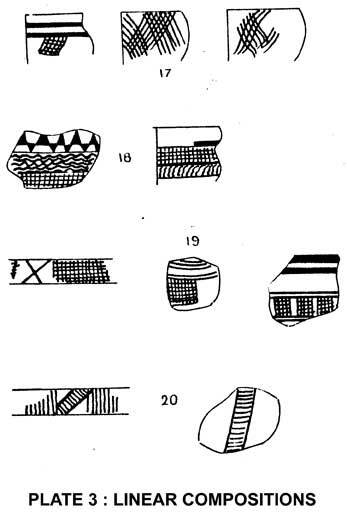 These are found from quite a few sites in Gujarat (Fig. 25). Wavy lines in vertical group: These vertical wavy lines are found either within horizontal bands (Fig. 26), suspended from other side (Fig. 27), or drawn independently (Fig. 28). Sometimes scrolls are attached on both sides. Such specimens are found from Lothal, Rangpur (Fig. 29), Surkotada, and Rojdi. This type symbolizes range of hills and a rather a rare element (Fig. 30). 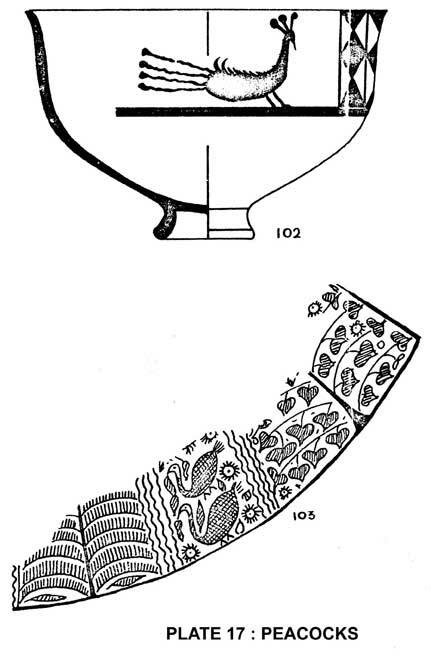 Ripple like: Aspecial feature of the post- Harappan pottery of Gujarat. This is a typical motif at Surkotada and also found at Somnath during post- Harappan period. With the introduction of potters' wheel, the triangles and angular motifs steadily gave place to loops and curving elements. In Gujarat, although loops emerged as purely geometrical, but were also used as arch motifs for enclosing other motifs. Loops are found in vertical as well as oblique lines. Loops work as a frame to enclose inner motifs, e.g. Sun, plant, dots in the circle, hatching, etc. During the post- Harappan period in Gujarat it was rarely observed. Triangle is the basic geometric motif, representing hills or hillocks. It was even used in incised decorations before the use of the painted decoration. Triangles were represented in upright and pendent posture as locked, hatched or merely in linear positions. With the use of grid, triangle motif became rare in frequency and popularity. It was used for blocking the half of the diagonally bisected square or filling four triangles created by crossing the square diagonally the use of triangle in grid, gave rise to another motif known as 'Double-axe' or 'Butterfly motif'. At Rangpur, Lothal, Surkotada these were freely used in a vertical or horizontal zone as a filler or divider, otherwise this motif is rarely used in Gujarat. At Somnath, the triangles are shown with wavy lines or sun-motif (dot in circle), perhaps having a symbolic meaning, indicating sunrise. 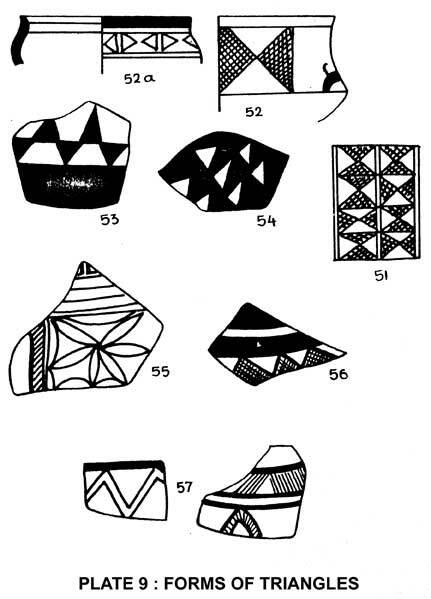 Another typical motif of the post- Harappan pottery found at Rangpur is the crosshatched triangles, with side scrolls were depicted. Squares are represented as secondary motifs and mainly found to enclose other motifs like four-petal flowers, sun motif, opposite hatched triangle. Alternatively filled or hatched squares served the purpose of space fillers, also a basic form of grid decoration. Specimens of this type are found from sites like Rangpur, Surkotada, and Lothal. At Somnath a peculiar example of hatched square with one line on top, dots on each side, two links from each block crossing each other. These are symbolized human beings in-group dance with hands in hands. Circles and its formations require a special mention in the painted pottery of Gujarat. These are also used as space-fillers, as border, as separate motif, as enclosure etc. Any rhombus figure drawn vertically or horizontally is a diamond or lozenge. 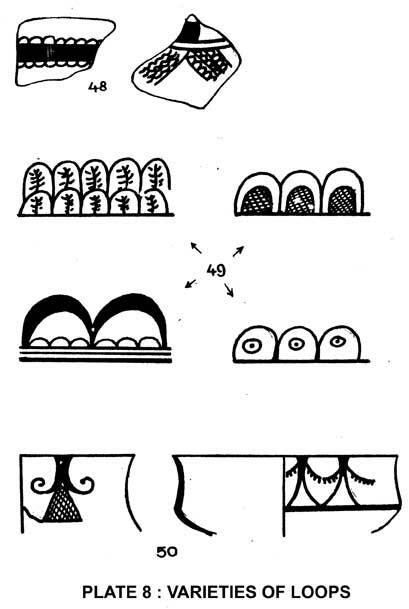 In Gujarat this motif appears very often in almost all Harappan and post-Harappan sites. These were used in the bands as borders drawn either vertically or horizontally or even as a series. Filled diamonds: It was a noteworthy motif at Lothal and Rangpur. At Rangpur filled diamond was found placed in the center of square. Naturalistic motifs are the representations of the living world in graphic forms. They include vegetation (floral), birds and animals (faunal), and human motifs. 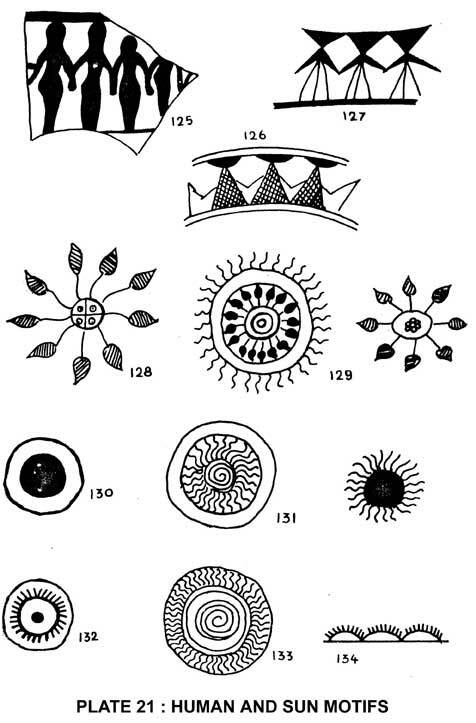 Faunal motifs indicated from paintings where animals like bison, bull, etc. was drawn. Human figures are also found along with these animals, as in hunting scenes. The Harappan potter painters were inspired by nature. It was possible to identify the palm-trees, neem trees, acacia, banana, or some other trees with broad leaves and above all Pipal tree, the ficus-religiosa. Some conventional plants with stylized leaves were present but subsidiary to realistic trees with beautifully swaying branches. Besides the above reeds, leaves and weeds of various unidentified types are drawn on the pots, as found from Lothal, Rangpur, Surkotada, etc. Purely human motifs are absent in the painted decorations of Gujarat. No human figure was depicted realistically. At Somnath stylized representations of a group dance is noticed, as mentioned earlier (Fig. 125, 126, 127). 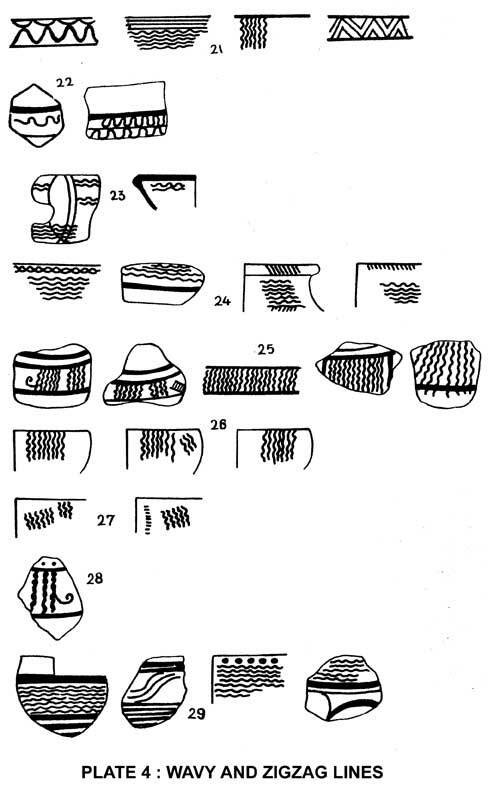 A unique human figure representation is found at Padri (PLATE 21A). It is a standing human male figure, crowned by a pair of large hatched horns and braided hair and wearing a garment represented by wavy lines (“grass-skirt”), which has been identified as “Lord of Beasts” (Shinde 1991). Like the pipal leaf sun motif might be a religious symbol. 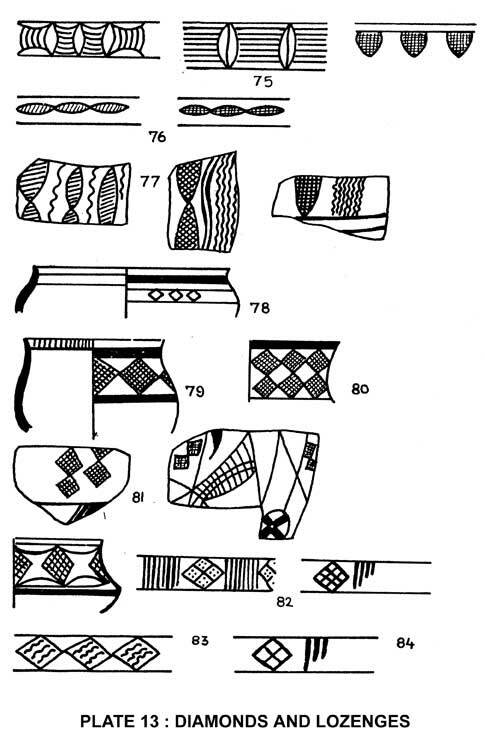 The sun-motif was popular as pottery painting element, although gradually it took the form of bands. In the post- Harappan phase, sun was represented by only a filled dot. The panel design at Somnath shows a dot between triangles denoting “rising sun between two mountains. It is so called because of its shape. This motif is found mainly at Somnath and on one specimen at Rangpur. It is analogue to the moustache-like motif from Kalibangan. 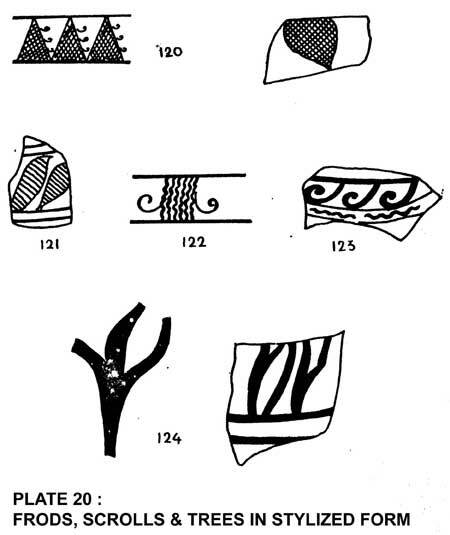 Also a combination of hook, triangles and human motifs, although stylized are found. Pottery making requires a lot of skill and experimentation. And therefore the innumerable pottery types and varied wares are only possible in an economically sound society, whose inhabitants have a leisure time, resources, as well as aesthetic sensibilities to produce such array of pottery with ornate painted designs. However, economic stability does not play a crucial role in the practice of pottery painting. It may be stated that this trend continues without any break throughout all periods of history, and is still a living tradition. The effect may, however be noticed in the quality of the ceramics. This issue needs further investigation and clarification in the light of ethnographic study. It is interesting to note the widespread distribution of particular motifs, elements, and styles namely, the linear, circular/curvilinear/dots and other geometric motifs and certain naturalistic ones as the “pipal” leaf across Gujarat. Such remarkable uniformity points to the far flung influence of the Harappan cultural ethos. On the other hand, a closer look brings forth certain differences in depictions of motifs between the Harappan sites in the Indus valley and Gujarat. Firstly, ripple like motif is found to be absent in Mohenjodaro and Harappa, while they have been profusely used in Gujarat, especially in Saurashtra. Secondly, the fish motif has not been found to occur independently in Gujarat. It is mostly associated with birds. 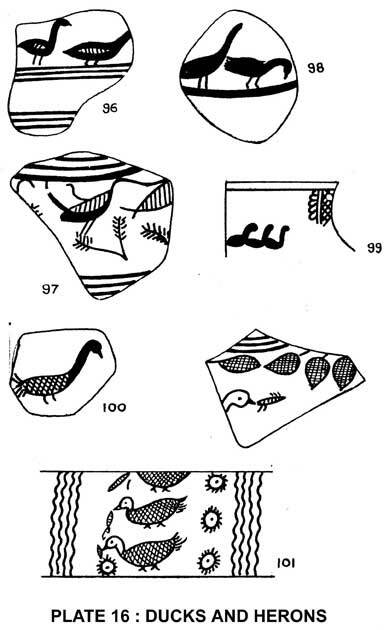 Thirdly, in the Mature Harappan phase both in Harappa proper sites as well as in Gujarat, one does not find much difference in representation of motifs. 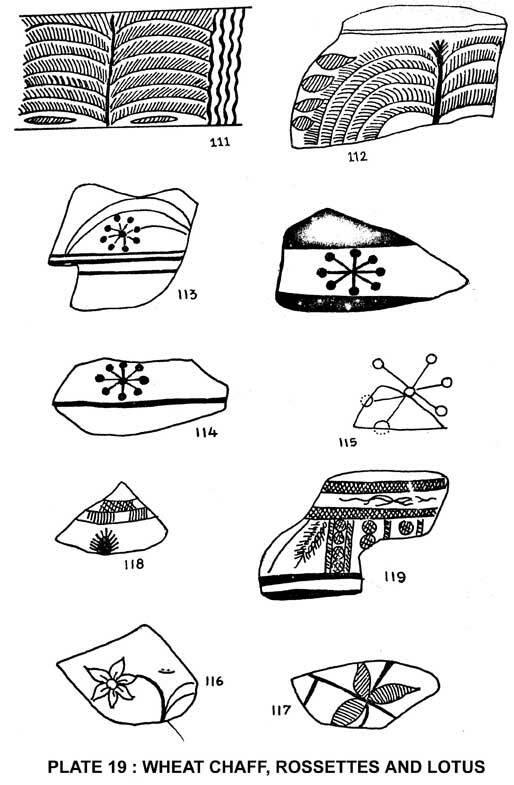 But in the late and post Harappan phases in Gujarat, the preference shifts to geometric motifs. However the meagre amount of naturalistic motifs represented, become stylized, as compared to the realistic depictions in the Mature phase. 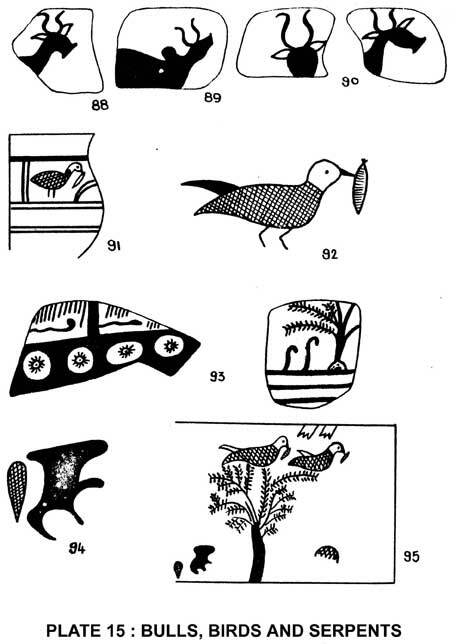 Lastly, it may be noted that the designs fill up the entire vessel body, except the base, in the Pre and Mature Harappan periods, while in the late and post Harappan period they become restricted within panels or registers in the rim and neck portions, with a few exceptions. The reason for such variations may be accounted to the fact that in Gujarat the paintings were not done by the Harappan artists, but by the local inhabitant potters, who applied his own imagination to produce new effects. Also it may be assumed that the trend of covering the entire vessel body lost prominence; perhaps the execution of designs in a more plain background became visually appealing to the potter/painter or even the people in general. 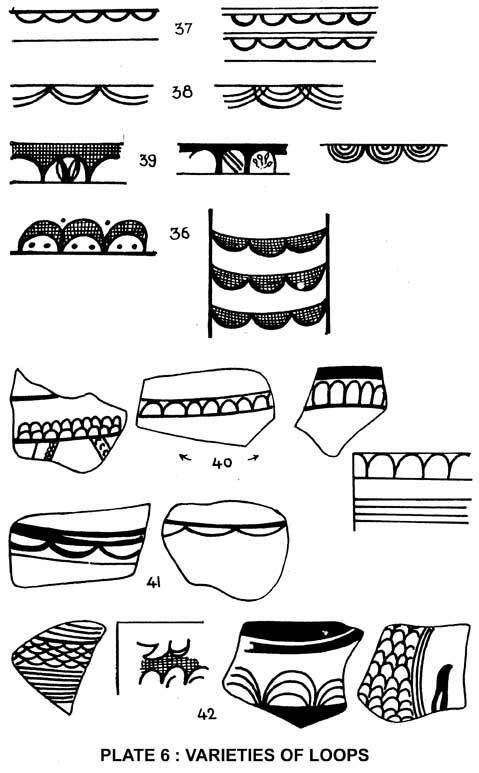 An analysis of the decorative styles by grouping the vessels or sherds into classes or types by the presence/absence of certain stylistic features may be used for reconstructing local and regional sequences as also inferences of gradual stylistic change (Rice 1987). Therefore in Gujarat such regional trends have been nomenclatured as Anarta, Pre-Prabhas, and Prabhas wares, Sorath, Padri and also Micaceous Red Ware and Lustrous Red Wares, spreading across Gujarat. On close examination, differences in the execution of the motifs, their presence/absence, the combination of various motifs used, may emerge in the trend, indicative of the regionality or local influences. Such differences along with the regional diversities may be used to formulate stylistic criteria to establish a chronology for pottery paintings in Gujarat. The painted decorations are a reflection of the excellent artistic skill of the artisans, their acceptance, and involvement in the social and cultural life of the society and its people. The general faunal depictions found in Gujarat, give an impression that the potter painters had keen observation of their natural surroundings, including the habits and behaviour of various animals and birds. The artists' love for nature is clearly visible in the masterly touch and exactness in depicting realistic patterns are unique. The artists depicting the designs had a very clear sense of utilizing the available space, sometimes restricting himself by drawing panels or registers, and sometimes depended on the shape and size of the vessel. Within the panels the symmetry in executing the designs using a basic element or repeating them with perfect harmony of the design is also remarkable. 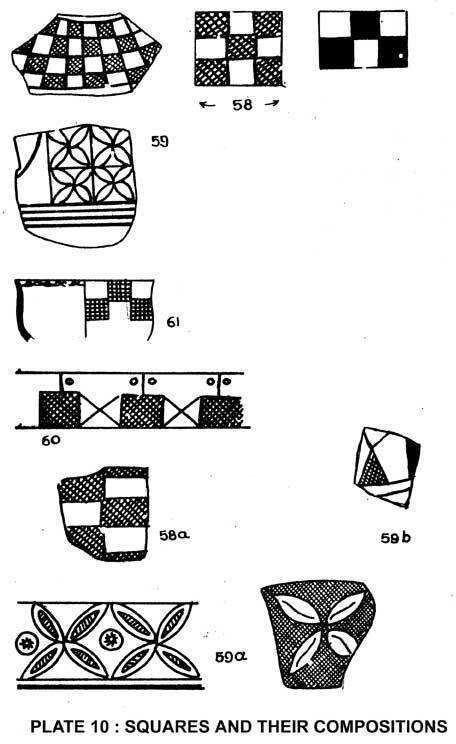 The preference in execution of motifs on the vessels may be connected to the ethnicity of groups using them, their general aesthetic perceptions or kin-relationship. The frequent depictions of the 'pipal' leaf motif and sun-motif, with such continuity is also significant from the religious point of view. These were perhaps worshipped during those times, as is still prevalent in India. It may be mentioned here that certain parallels in decorative motifs like, loops, squares, dots, stylized birds and animals, floral designs, sun-motif, etc. are also found in protohistoric Mesopotamia. Hence a trade and exchange contact is definitely indicated, as corroborated by other evidences. Also a certain degree of uniformity is noticed in pottery painting styles extending from Kachchh to Saurashtra, to north Gujarat, thereby pointing to the far-flung influence of the Harappan cultural ethos. It will perhaps be not out of place to mention the ethnographic work carried out by Carol Kramer in cities of Jodhpur and Udaipur, Rajasthan (1994). She has observed that in Rajasthan and many other parts of north India women are forbidden to touch the potters' wheel. Therefore the female members were active participants in other activities including appliqué decorations and painting vessels. A similar study done by Archana Choksi (1994), in two villages, Gundiyali and Lodlai, in Kachchh. She observes that among the Gundiyali potters the line work is done by the males and the filling by the females. While in Lodlai, the entire painting is the responsibility of the women. These may be viewed as examples of simply a division of labour, or may indicate a patrilineal social organization among the potters of Rajasthan and Gujarat to some extent. However, it requires further study to develop any such model. Thus the excellent workmanship of the Harappan potters of Gujarat is clearly established by the regularityof forms, outstanding symmetry between various component motifs, supplemented by the best rhythmic effect. The paintings demonstrate a remarkable blend of geometrical as well as natural motifs, rendering natural harmony to the subject. None of the motifs represent an isolated occurrence, but the entire repertoire of painted designs is found to continue, but of course with variations and modifications, in the cultures that succeeded the Harappa culture throughout India. 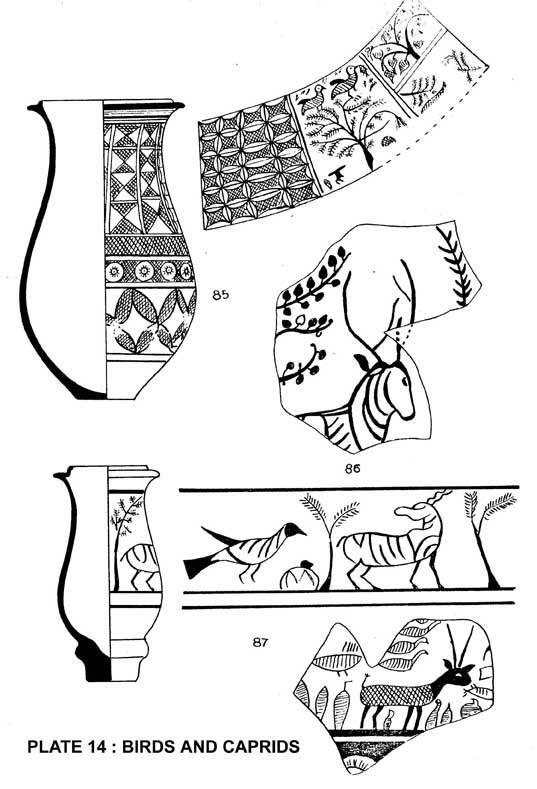 A detailed study of painted decorations on pottery is sure to emerge with more interesting facts about the stylistic and thematic diversities indicating localized or regional developments. Further in this paper we have not taken into consideration the colour of the paintings, the wares on which they are depicted, or their peculiarity in depiction confined to particular shapes of vessels. A detailed study taking into consideration all the above-mentioned factors is likely to yield fascinating results. The synthesis and integration of the Harappa culture with indigenous counterparts, along with the regional diversities offer interesting data to understand the process of cultural transformation. Choksi, Archana. 1994. An Ethnoarchaeological Study of Pottery Manufacture in Kutch. PhD thesis (Unpublished) submitted to the M.S. University of Baroda. Joshi, J.P. 1972. Excavations in Kutch and Excavation at Surkotada and New Light on Harappan Migration. Journal of the Oriental Institute Vol. XXII. Oriental Institute, Baroda. Kramer, Carol, 1994. A Tale of Two Cities: Ceramic Ethnoarchaeology in Rajasthan. In Bridget Allchin (Ed.) Living Traditions. Mohan Primlani for Oxford & IBH Publishing Co. Pvt. Ltd., New Delhi. Manchanda, O. 1972. 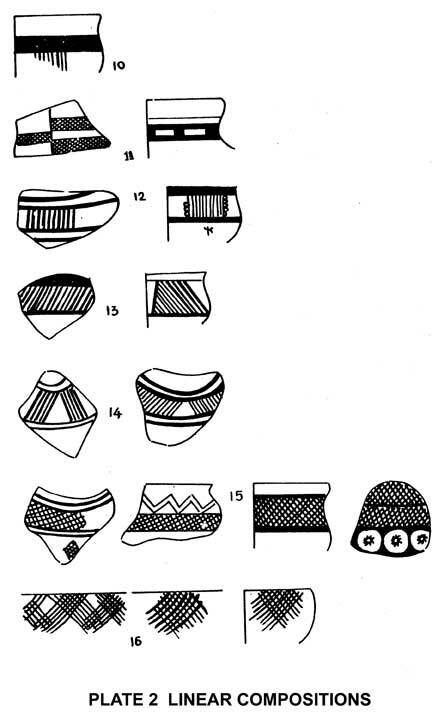 A Study of Harappan Pottery. Oriental Publishers. New Delhi. Rao, S.R. 1963. 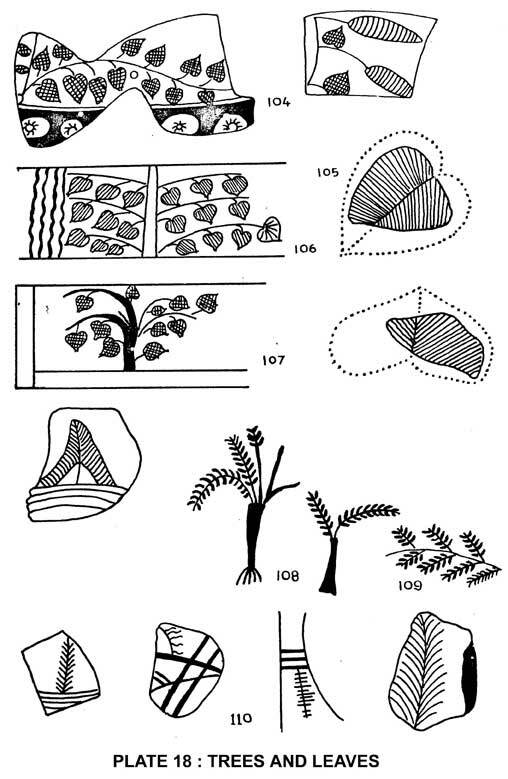 Excavations at Rangpur & other excavations in Gujarat – Ancient India, no.18-19: pp13­-27. Rice, P.M., 1987. 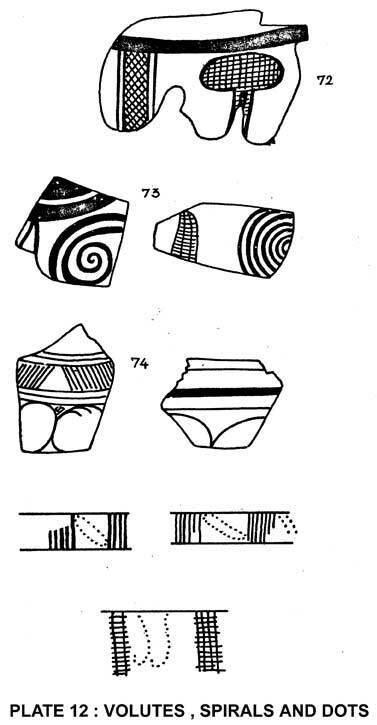 Pottery Analysis: A Source Book. The University of Chicago Press, Chicago. Shinde, V. S., 1991. A Horn Headed Figure on a Harappan Jar from Padri, Gujarat. Man & Environment, Vol. XVI. (No.2), pp. 87-90.